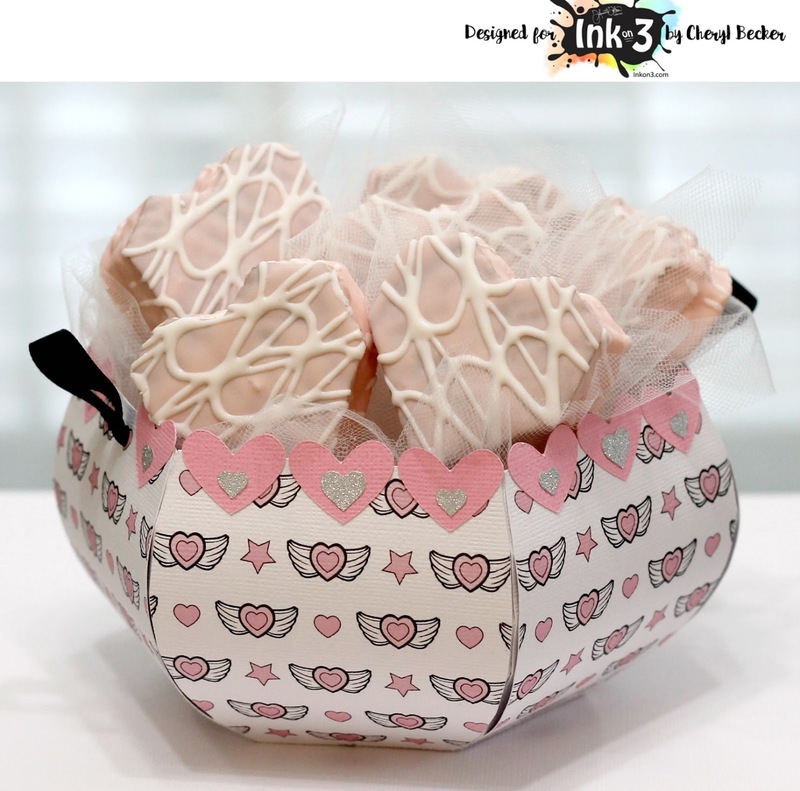 Cheryl here on the blog today, I love this easy to create basket SVG file by Ink On 3! I've made it several times. I decided to make it for Valentines Day and put some cakes in it for my grand kids when they come over. I chose this pattern of digital paper from inkon3's new collection and printed it out on my home computer. You can also take the files on a flash drive to a local copy store and have them print it for you. I opened the svg files in my Ecal software and cut it out using my Eclips2 cutting machine. Assembly of this basket it very easy! I opted to use ribbon for my handles instead of the one included in the kit. 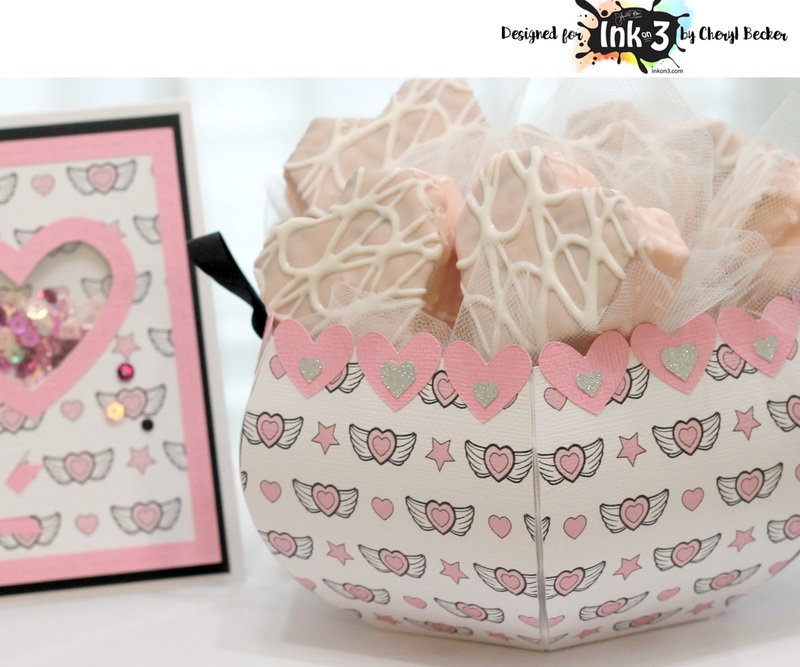 I used one of the heart cuts from the card file and cut a bunch for the edge of the basket. I spaced them out for three on each panel. I then used a heart punch from my stash and cut out tiny hearts from some silver glitter paper and layered them on top. Pictured in the background is the card I made last week to go along with this. I used one of the new shaker cards available in the SVG section at inkon3. This would be a very nice gift to bring to a loved one for any special occasion. So, that's it from me for today. I hope you'll head over to InkOn3 and check out what's there. 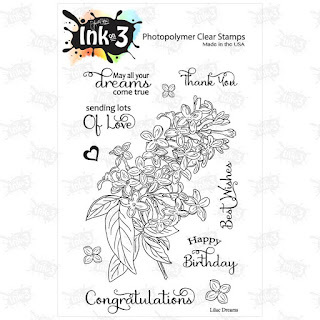 You'll find a great variety of stamp sets, and svg files, and digital papers to print. Here's where you can find what I used in these projects. So that's it for today. Hope you got some inspiration and will head to the store and will follow us on FB and Instagram. You'll see lots of really cute things from our Design Team. Today I am sharing a pretty card I made using a stamp set from Ink On 3. 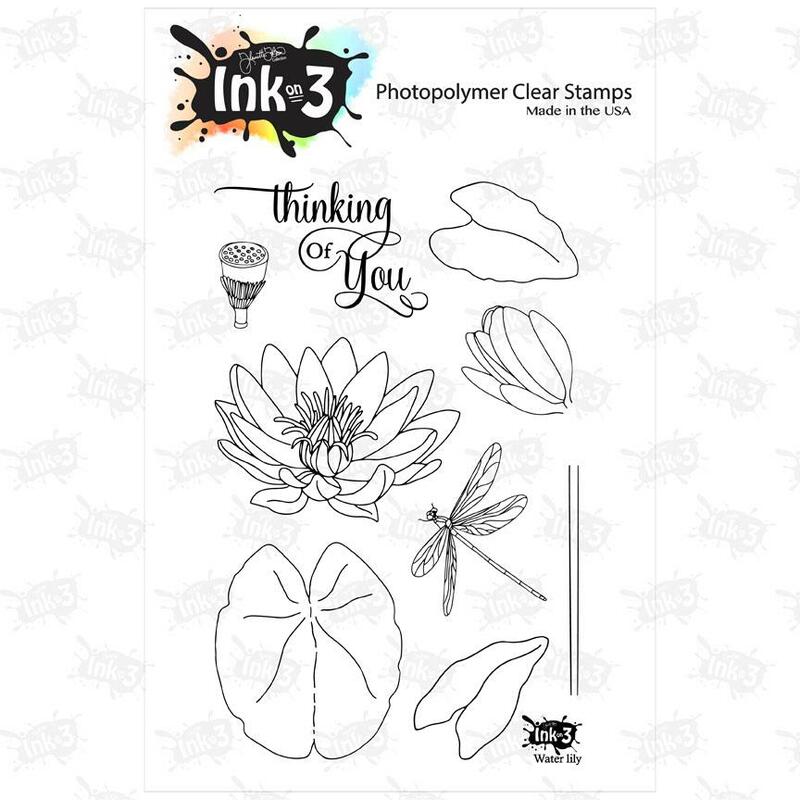 The stamp set is called Water Lily. 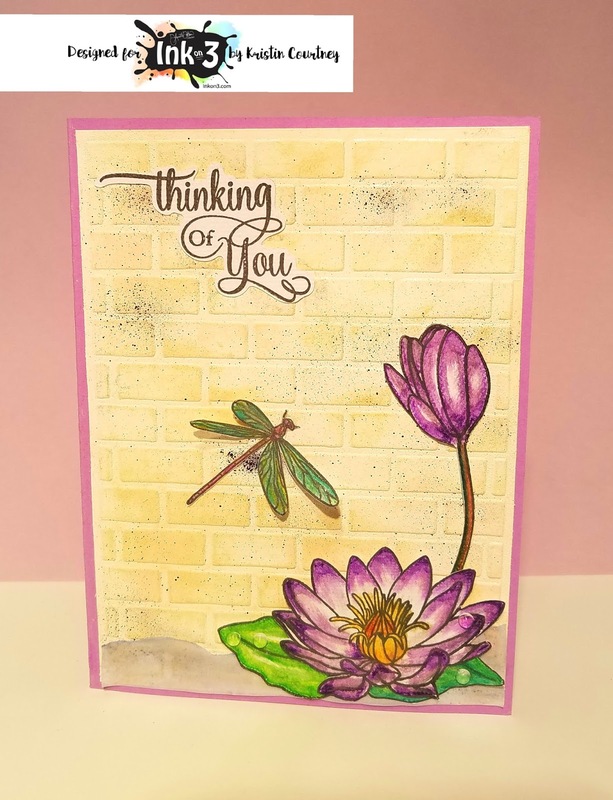 The water lily and dragonfly are colored and placed on top of an brick wall embossed background I made. For some cute detail, I added a few 4mm sparkling clear droplets. I used a glitter pen to add some sparkle to the dragonfly and flower. 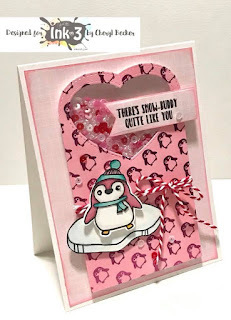 Today, I am sharing a Valentine card I made using Ink On 3's stamp set called Snow Buddies. 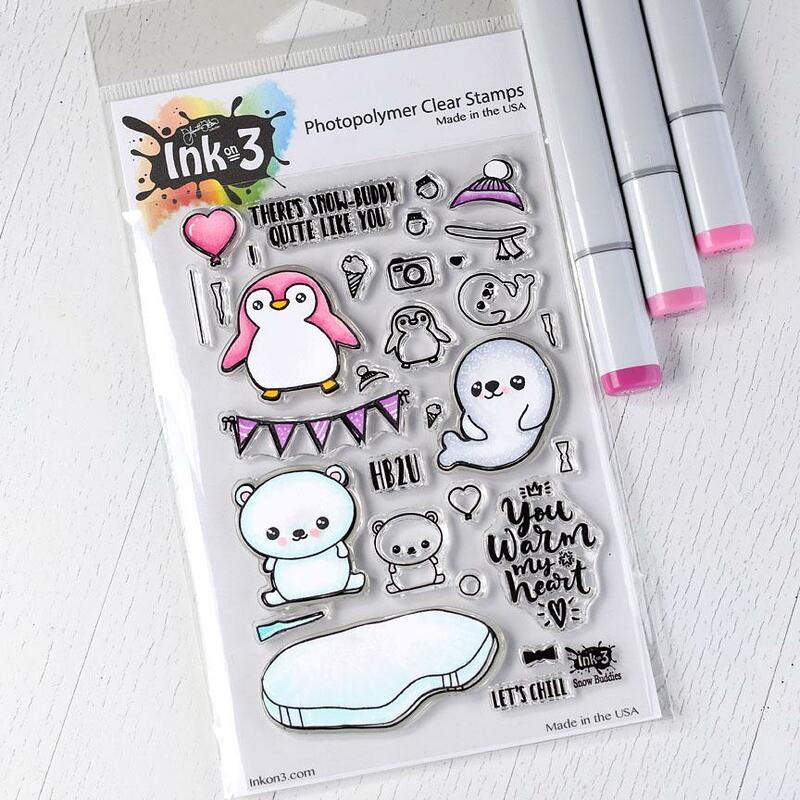 Super cute set with so many different stamps in it! The Digi Die Cuts for the stamps are free with the stamp purchase. This makes stamping so easy with no fussy cutting. The pretty sentiment comes from the Lilac Dreams stamp set. I also used the Door Card that is FREE on her site right now! Hey there! I have some super fun Valentine treats to show you today. 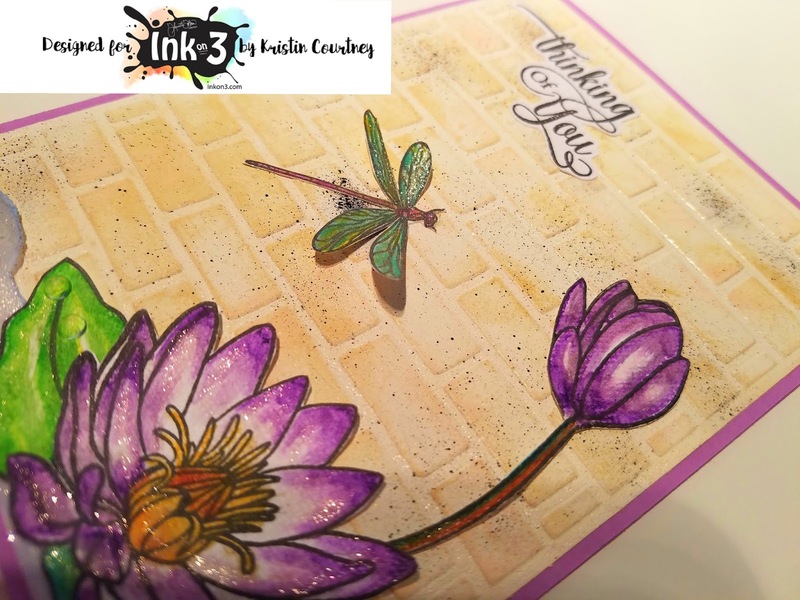 Using InkOn3 digital papers and stamps. Let's get to it. 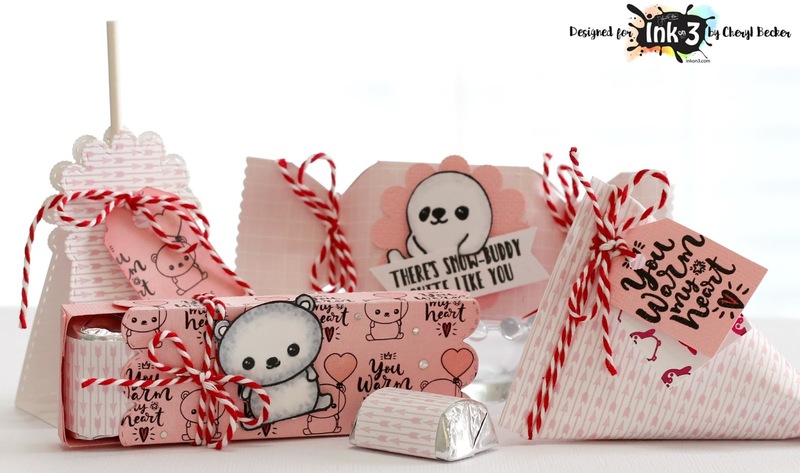 All my treat packaging was created using dies from My Creative Time. I printed out my digital papers using files from InkOn3. 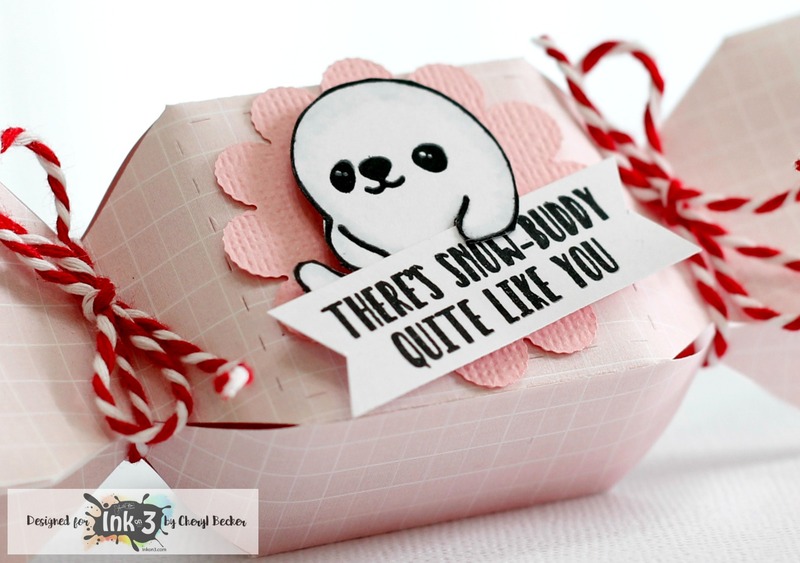 I also used tags and stamps from the Snow Buddies stamp set. How cute is this little seal?! Adorable, right? I very lightly colored him in very pale gray, just around the edges for added dimension. I cut around his fin so I could tuck in my sentiment. For this slider box of chocolate nuggets, I added a bit of color and sparkle to the digital paper. Colored up the adorable bear, tied some twine, and added some sparkle sticker dots. I wrapped a strip of digital paper around each nugget. This slider holds four. Ok, so how many of us own that crimping tool? I used a rectangular piece of paper and strong double sided tape to close one end. Then again but rotated a bit to get that sour cream packet look. I then crimped each end a tiny bit to give it that "for real" look. I stamped out the sentiment on one of the mini tags from this release. I love those little things! I also used a piece the penguin paper printed on the laser printer so I could foil it using bright pink foil. So fun! Finally, I used a sucker holder die with more digital paper. 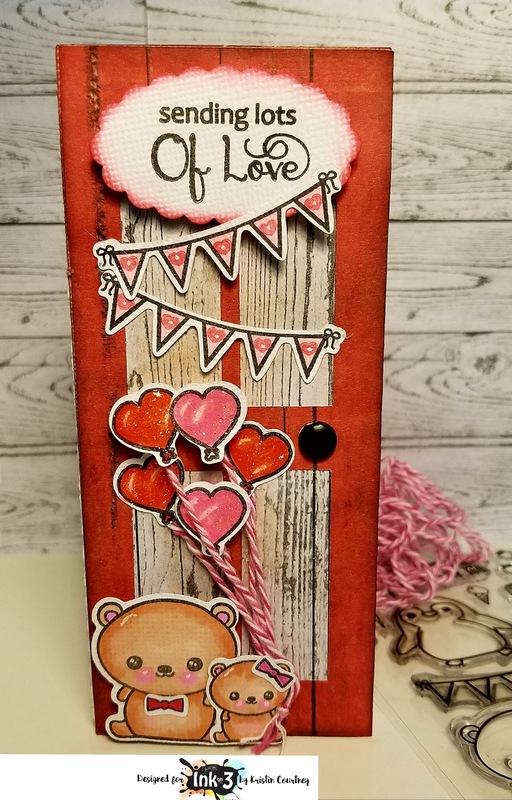 I ink blended onto another mini tag and attached it using more twine. This die comes in this size for bigger suckers and a mini one for small suckers. I love these! Perfect for children to bring to school. So there you have it. 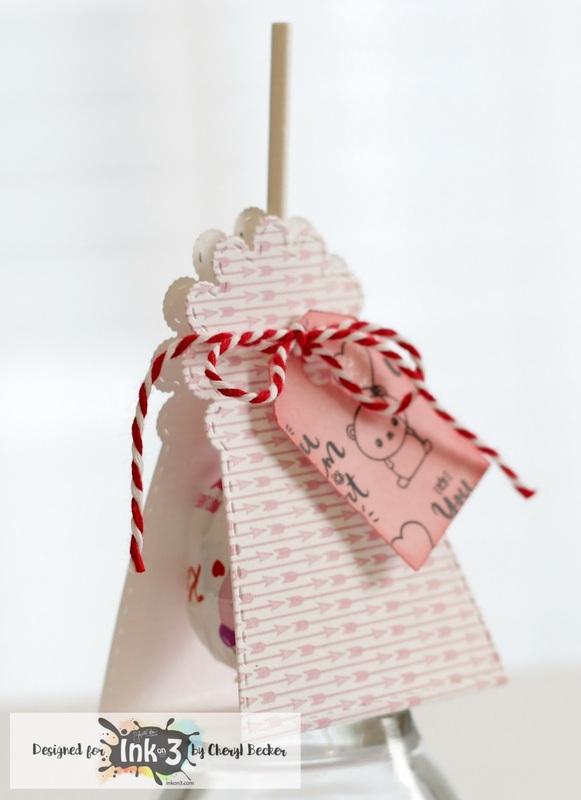 Some super fun ways to hand out some goodies. Here's where you can get these items. I hope you got some ideas for making treats with your children. Let them help you, they'll have so much fun! Don't we all want our kids to tap into their creativity? And make some great memories along the way. Today I am sharing a card I made using the new stamp set from Ink On 3 called Snow Buddies. This set comes with FREE Coordinating Digi Die Cuts too! I also used the Snow Buddies Card Fronts/Coordinating Paper Pack. 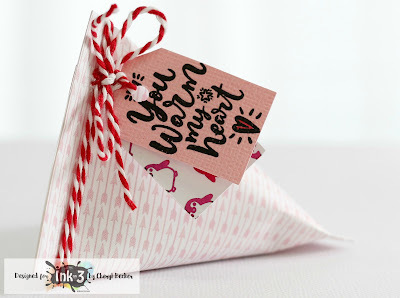 Super cute images and an easy way to add to your projects. These Card Fronts can be foiled too! Here is the whole Snow Buddies set with all the cute stamps included. So, I have been playing around with the new release stamp set from InkOn3.com. It's sooo cute! Here's one card I made. I printed off some of the digital papers on a laser printer. 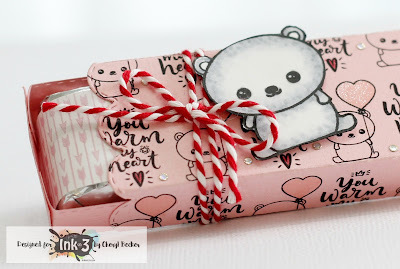 I then grabbed some pink foil and foiled it using my Minc. 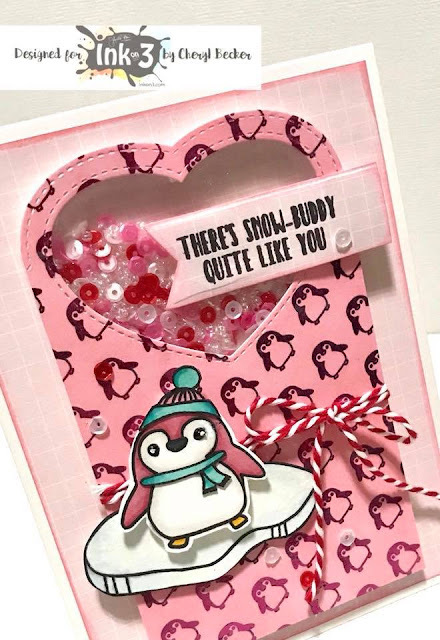 I used some distress ink and blended on some pink ink. So hard to capture the awesome shine of the foil. 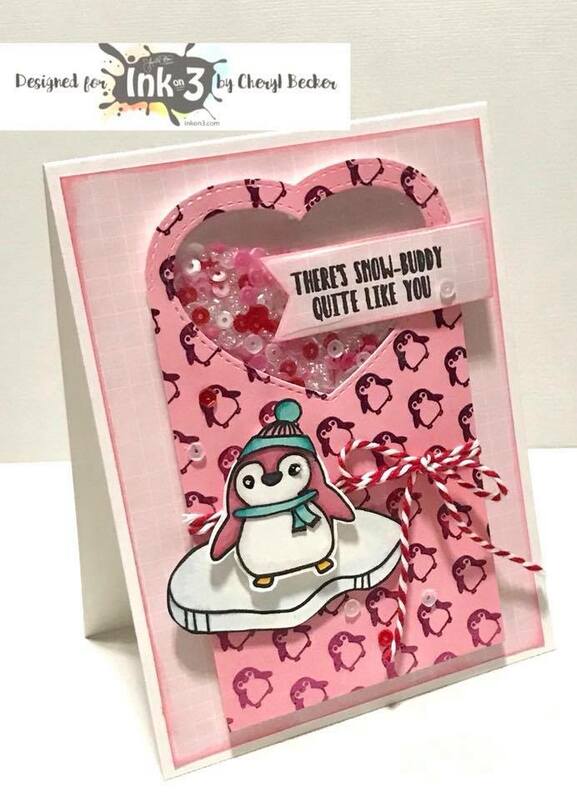 I then used a tag die by KatScrappiness and cut the paper. I trimmed of the sides to make it narrower to fit the card front. I backed it with acetate and used foam tape to create a well on the backside for the shaker bits. On top of that, another piece of acetate to close it up. This makes it easy for placing on the card without shaker bits going everywhere! I tied a bit of twine around and set it aside. 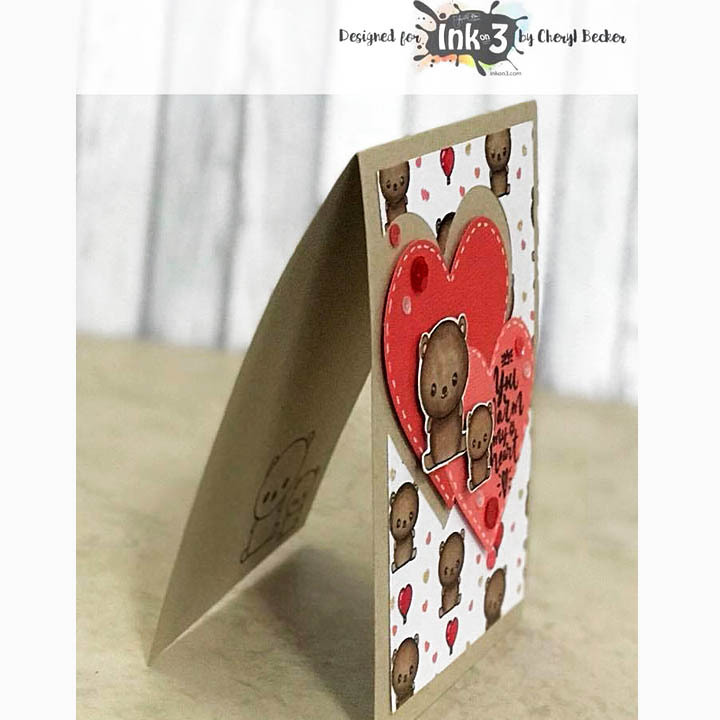 Using another of the printed papers, I cut a layer for the card front and inked the edges and used tape runner to adhere. I then glued the tag piece to the card front. 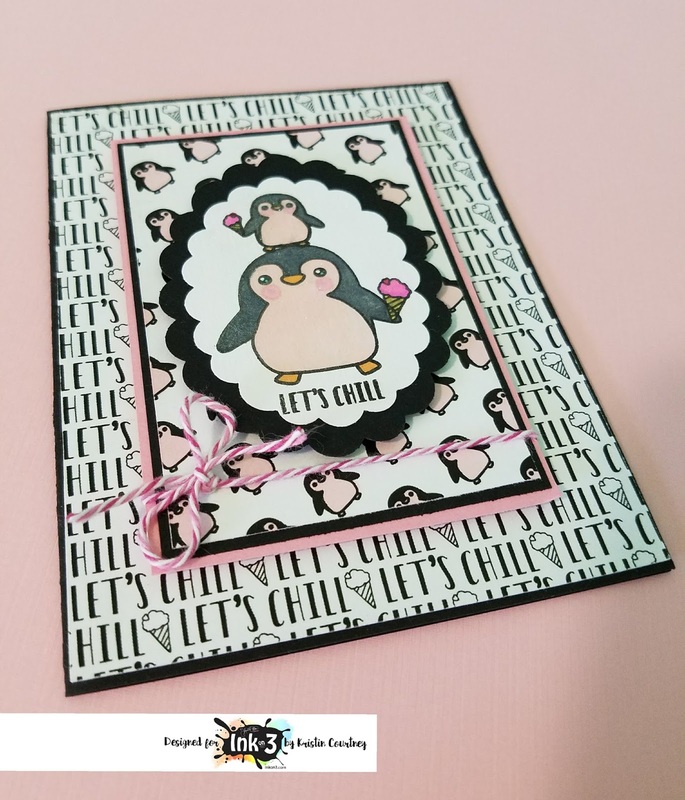 I had stamped out and cut using my Scan N Cut, one of the penguins. I colored it with my Spectrum Noir alcohol markers. Using foam tape I added this to the card front. Stamped the sentiment and cut using a banner die in my stash. Added it with foam tape as well. Using some of the same sequins as the shaker, I glued a few around on the card front. Brushed on some Wink of Stella and called this one finished. Here's where you can shop for the products I used. Hope you got some inspiration and will get out your supplies and get your craft on. Head to InkOn3 and check out all the great stuff! I cut 2 masks for each penguin, 2 large ones and 2 small ones. 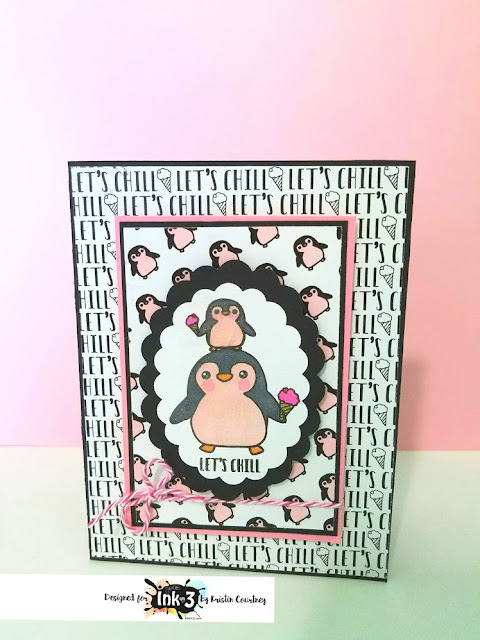 Then once those were cut out I started stamping and masking all around the pink penguin. Once the cluster of penguins was stamped I did some simple coloring with Zig brushes and fussy cut the entire grouped image out. Next, I glued them down to a night sky background I had created using Kuretake Gansai Tambi watercolors, to which I had already added the sentiment to the bottom corner. I then glue on the mitts and the hat to the pink penguin and added some liquid applique to the pompom. I also added some glossy accents to each of the little penguins eyes and beaks for some added dimension. I finished the inside of the card with this cute birthday banner and added my sentiment. If you are curious about any supplies I used check out all the links over on my blog. Hello Everyone, Ilda here again and Happy New Year to you! Hope you have been enjoying some holiday time at home with the family. 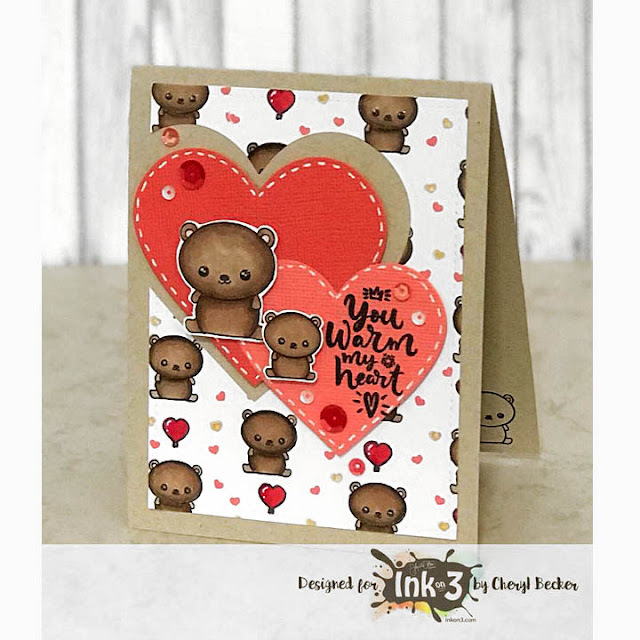 Today I'm back with another Valentine's Day Card featuring Ink On 3's newest Stamp Set Snow Buddies. I can't get enough of these cute critters. To begin I stamped my images on some Bristol paper and did some masking to create the cute little scene. To the images themselves all I did was add some shadowing and rosy cheeks using Zig markers. To create my waves I used 4 different shades of blue and drew wave like lines along the bottom half of the card and blended them out with a water brush. For the sky I lightly blended out some peacock feathers distress oxide ink. Once my coloring was done, I die cut the front panel and added some Wink of Stella to the balloons and ice. Finally I finished it off by adding glossy accents and waited for it to dry. 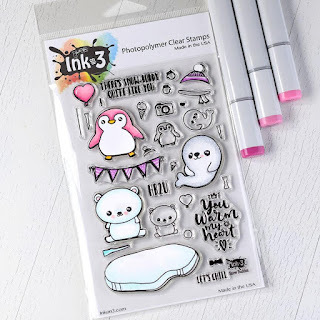 Hope this card has inspired you to go on over and check out this super cute Snow Buddies Stamp set from Ink On 3. Plus take advantage of the FREE Shipping + Coordinating collections that are also 20% off! Cheryl here sharing a card I created using the new Inkon3 stamp set Snow Buddies. We’re showing some ideas for Valentine’s Day. So I stamped a background and cut a heart out of it. Then two hearts smaller and added with foam tape. Colored the cute bears with Spectrum Noir alcohol markers and fussy cut. Added with foam tape. Added some white gel pen stitching and stamped two bears inside. I added a few sequins and called it done. Head to the website Inkon3.com and check it out.